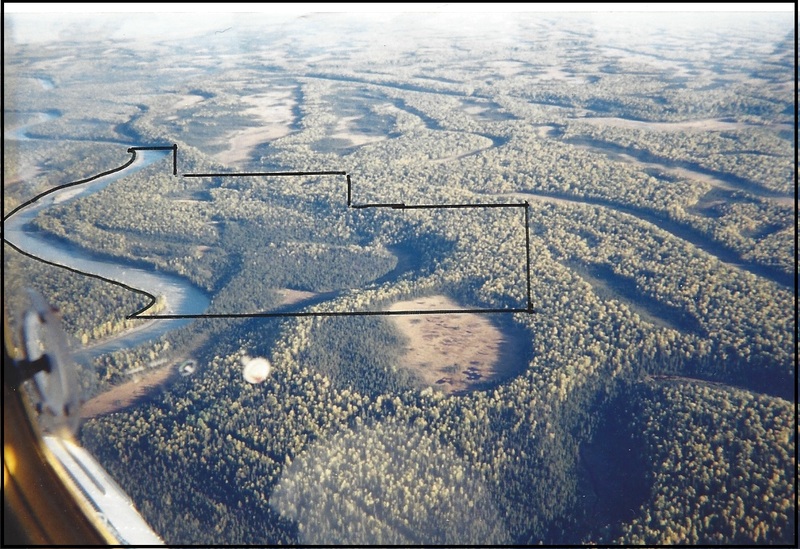 Grant Lake Corporation owns 1,000 acres of contiguous claims along the Kahiltna River approximately 31 miles from the intersection of Petersville Road and Oilwell Road in the Yentna Mining District. The claims are located about 150 miles north by northwest of Anchorage Alaska. Substantial gold discoveries and small production has been completed close to and on the claims. Exploration sampling and analysis has determined that consistent gold distribution throughout the claims warrants additional exploration, evaluation, development and production. This technical report makes certain assumptions about reserves, productions rates and costs that will need to be verified. Sampling and testing and pilot mill operations on the claims has inferred gold reserves to be approximately 4,000,000 cy of pay gravels with an average recoverable rate of .016 ounces per cubic yard of pay gravels. More intense exploration and pilot mill testing has proven production quantities of 130,000 cy that can be mined for gold and gemstones for a profit. This technical study does not include gemstone recovery. Exploration cost estimated in year one, four and eight is $100,000 each. The exploration activities are to convert the indicated reserves to measured mineral resources and proven reserves commensurate with the planned 400,000 cy/season production schedule. The conceptual cost estimate for total installed cost of development including plant, equipment and infrastructure is $6,287,500. The first year conceptual cost estimate for production is 2,087,500. Additional capital cost after 5 years of production is $3.3M. Total first year capital required to develop this project is $7,877,500 including the first year production. Equipment replacement capital cost planned in year 5 is $3.3M. The total initial capital cost will be recovered in 3 years including 8% simple interest. Total revenues over the current planned 10 year project life is $76,800.000. The Net Present Value is $18.6M at a 5% discount rate. The planned Internal Rate of Return over the 10 year series of cashflows is 26%. Annual average profit forecasts over 10 years is $2.4M annually. The conclusion of this technical report recommends to continue exploration commensurate with a 400K cy per production season, develop infrastructure, mining and milling facilities, and produce gold in the quantities and schedule described herein starting in 2019. Grant Lake Corporation, the owner of the Kahiltna Placer Mine project is seeking to operate, joint venture, lease, or sell the mine. If Grant Lake Corporation operates this mine it is seeking $8 million for startup capital to complete exploration necessary for 3 years of proven reserves (1,200 cy of pay gravel), develop the mine and mill site, and put the mine in production in 2019 and continue production for 10 years. An investment can be made directly into the mine operations or through the purchase Grant Lake Corporation preferred stock through our 506c Private Placement Offering. The Property consists of 16 state claims shown in the map below with a total of approximately 1,000 acres. The west side of the Kahiltna River is closed to mineral entry. The Kahiltna Placer mine is located just south of the Alaska Range and Denali. It has a small camp, runway, accessible by road and was prospected by Ed Ellis, a life long Alaskan gold prospector. The Kahiltna River is fed by the Kahiltna Glacier just south of Mt. McKinley. It has been well explored, sampled and tested and has inferred reserves of 5M cy with and average if .016 ot/au. The Mineral Report on the Kahiltna River Placer Property Prepared by Licensed Alaska Professional Geologist Certified AIPG Professional Geologist December 1992 Daniel Freitas Consulting Geologist for Gold Gulch Gold Mining Company provides geologic and mineralization information on properties close to the claims in this report. Understanding the geology of a mining property is necessary for the proper valuation and to give direction to the further exploration. If you know why the gold is where it is, then it is possible to predict where else it may be. We know the gold was transported from its bedrock sources in the Peters Hills, Collinsville area and various other unidentified spots in the Alaska Range. Glaciers and streams have moved the gravel and gold from the lode sources during the past few million years. Since there was a huge slug of auriferous rock debris left in the way of the Kahiltna River, the river had erode it and sluice it. The river has been concentrating the gold out of the glacial deposits and into the present and former channels. The Kahiltna Glacier is large even by Alaskan standards, but it is only a shadow of its ice age self when it extended past Anchorage. This glacier has advanced and retreated many times in the past million or so years. The advances and retreats are important to the transportation of the placer minerals because glaciers act like enormous bulldozers that push rocks as they advance and then leave them strewn down valley in many large heaps. Since the rocks that the glacial dozer were gold bearing Capps, 1913. p.50), the gold was carried farther down the valley than the river normally would have washed it. The most recent ice age glacier had alot to do with the placers in this area because it dumped its load in this area and then sluiced it with its meltwaters. As the glacier was melting the floor of the Kahiltna1 valley was filled with many braided channels like you see today farther upstream just below the Kahiltna glacier. In the 10,000 years since the glacier was in this area, the river has eroded down through the weakly auriferous glacial deposits and even into the underlying bedrock. As it cut down through these sediments, it re-sluiced them to concentrate the heavy minerals into the riverbed. The river eroded deeper and deeper, so that now it is several hundred feet below its ice age height. As it cut down it changed channel often. Some of these abandoned channels are left as benches on both sides of the river. bedrock under the river bed acted like the floor of this 400 foot wide sluice box where the heavy minerals and boulders (photo 4) were concentrated for thousands of years. What was formerly placer bearing river bed alluvium is now part of the extensive network of placer bearing benches. Bedrock under the river is a Tertiary formation composed of stream gravels, lignite coal, and lake sediments. Bedrock in the mine area is a dense, smooth clay. It is possible that some of the gold and platinum in the valley came from the Tertiary stream channels. Where ever the gold came from, it seems to be present in adequate quantities to develop a lucrative large volume placer mine. Sub economic amounts of gold are found in the glacial till, glacial outwash, and the Tertiary stream channels of the bedrock. It is unlikely that these landforms would be future undiscovered resources. The present stream alluvium and the former stream alluvium of the benches provide ample resources and reserves to mine for at least a quarter of a century at a rate of 100 yards per hour. These landforms could have the richest concentrations and are almost totally unmined. 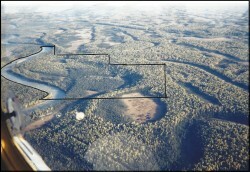 Figure 2 is an aerial photo that shows about 22 river miles in the vicinity of the camp and airstrip. (The airstrip does not show because the photo was made in 1952.) The extensive network of benches has been highlighted with a yellow felt tip pen. Use the drawn in airstrip as a scale, it is 1240 feet long. The property is essentially unmined even though mining has occurred off and on for almost 90 years. The previous mining has only scratched the surface. Gold Gulch Gold Mining Company has been prospecting and mining (photos 5 & 6) for two summers (1991 & 1992). Gold Gulch has shown that it is lucrative to mine this ground even at small rate of 25 yards per hour. At the most this operation may have mined 20,000 cubic yards. The mineralized zones on the property is placer gravels that have be reworked and deposited from advancing and receding Kahiltna Glacier over the last 10,000 years. Yentna Placer district has produced over 200,000 oz/au from 1905 to 1960. Bill Bell and Jerry Holland staked the PGE Claim Group consisting of 11 claims around 1993. Ed Ellis was granted permission to stake over the PGE Claim Group around 2002 and added the contiguous Monazite Claims 1 through 5 adjoining the PGE claims to the north for a total of 16 claims covering 1,000 contiguous acres. Ed Ellis quit claimed all 16 claims to Diamond Gold Corporation around June of 2017. Ed Ellis passed July 12, 2017 and Ann Ellis the majority owner and officer of Diamond Gold Corporation quit claimed the 16 claims to Grant Lake Corporation December 4, 2017. Bill Bell and Jerry Holland researched the history of exploration and production of Placer Gravels in the Kahiltna River and found historic production. They performed their own trenching, panning, sampling and analysis discovering placer gold and platinum and cleared and graded for a 1,000’ runway that existed on gravel soils. They mobilized a generator, fuel tank, wash plant, dozer, excavator, loader, and other tools and supplies for two summers of placer mining operation. Bill Bell and Jerry Holland built a road from the runway to the river and built a gravel ramp to the wash plant and excavated and hauled an estimated 300 CY from the river bed to the stockpile location near the wash plant. Bill Bell and Jerry Holland excavated below the water table for a settling pond that filled with water. Water was pumped from the settling pond to the beginning process of the wash plant. Discharge was gravity fed back to the settling pond and recycled water for use back into the wash plant. They processed approximately 25 cy of pay gravels through the wash plant. The wash plant broke down during operations and lack of spare parts and lack repair expertise caused the termination of operations. A final plane wreck caused the group to cease operations permanently and abandon the 11 claims. Bill Bell and Jerry Holland demobilized the heavy equipment and left the wash plant, fuel tank, and several 55 gallon fuel containers and oils. We found no major production records for the property. Production was reported at .02oz au/t and .017 oz au/cy close up and downstream of the claims referenced in this report. 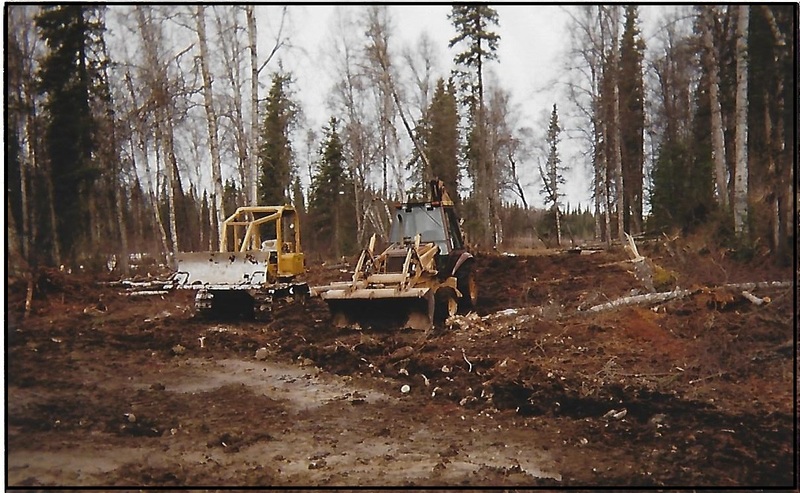 Extensive exploration work has been completed on PGE1, PGE3, PGE 4, PGE 5, PGE 7, PGE 9 using trenching, sluicing, panning, sampling from existing trenches, dozer excavation and backhoe excavation sampling. The initial production plan for mining includes these areas of extensive exploration. Total area explored using standard exploration methods consistent with delineating proven reserves is over 160 acres. This accounts for more than 5 years of production based on a 400K cy annual production rate. 1,277 locations were sampled on the claims and the average gold content of .016oz/t was determined and consistent throughout. Three to five pounds of black sands per cubic yard was measured throughout the exploration sampling. Approximately 1 lb/cy of gem stones and platinum grains were present. Pictures below document 12 sampling and testing locations performed on PGE and Monazite claim groups. The quantity of gold and depth of pay gravels were the targets of the exploration program. Several methods of sampling are depicted in these photos and performed throughout the claims. To test the depth of the pay gravels trenching was performed using a 580 Case Backhoe with a 14’ below grade reach. The depth of the pay gravels is estimated at 10 feet deep after three feet of overburden was removed. Sampling was performed in tier 2 shown in the Placer Test Site Tier 2 Bench PGE 1 pages below. Six samples (S-1 through S-6) were taken from digging below the overburden and either assayed and / or panned to determine gold content. S-1 and S2 were panned using the gravels from the shovel and reduced to approximately 100-1 ratio by weight assuming a pan weighs 7 pounds and a sample weighs 1 oz. The assays from those samples indicate an average of .016 oz/au/t. Note that the measurement of gold content was calculated using a jig system. 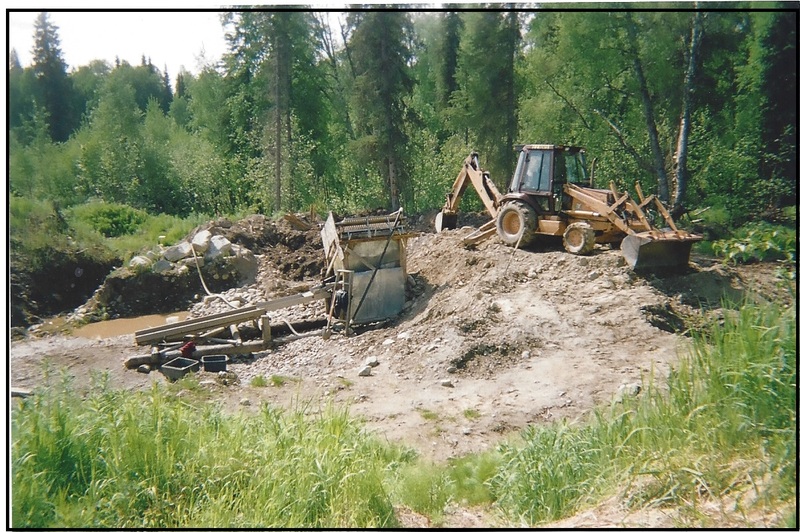 Further testing included excavating 1,000 cy of gravel and running it into a grizzly and sluice box. 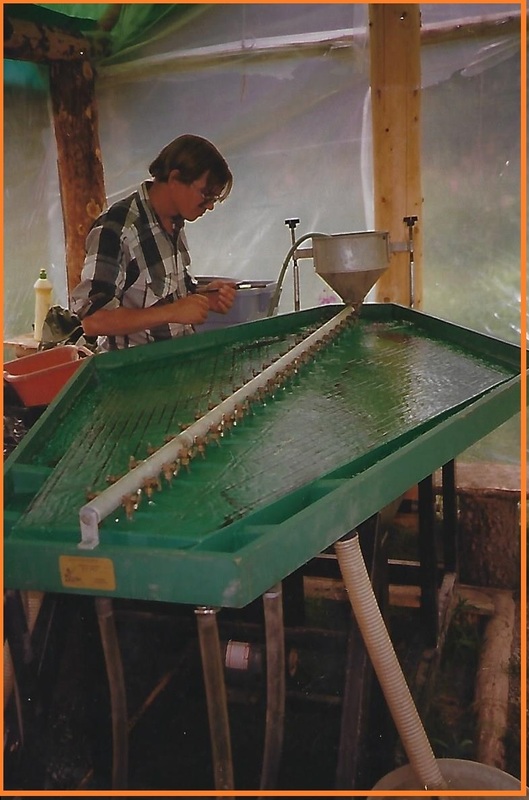 The miners moss from the sluice box was washed into a tote and screened to a -20 mesh. The -20 mesh material was run through a Gemeni Table or corduroy cloth. The corduroy cloth had significantly better recovery than the Gemeni Table. Concentrates out of the sluice miners moss sized to -20 mesh as extracted from 150 cy of gravels recovered 2.5 oz. Tailings from the sluice box was further panned and black sands was observed. Hand sampling and trenching was conducted on Herbert Creek located at PGE 2. Panning determined numerous au color and abundant black sands present. On PGE 3 overburden was removed and shovel samples taken two feet below the gravels. Numerous au color was observed. Boulders 6” and larger made up about 15% of the mass during the excavation of 1,000 cy during the sampling and testing phase. Cobbles 6”-3” made up about 30% of the mass. Gravel from minus 3” to plus ¼” made up about 40%. Sands and silts minus ¼” made up about 30% of the mass. Within the sands and Silts occurs the heavy garnet/black sands concentrate carrying the fine gold average 3 to 5 pounds per cu/yd. The shape of the gold is ¼” along the longest axis but again being very flat and thin. In shape, the flakes are sub-rounded and not always as smooth as first appears. Under a 10X hand lens, gold particles show signs of roughness and thickness. The gold is flakey, requires 80,000 to 120,000 colors of pieces to constitute one net troy ounce. This includes the minute, but recoverable colors. The flakes are seen to be easily buoyed by water flow and water tension. Kahiltna River gold is Fine-the bulk of gold occurs in the -50 to +100 mesh-there are some ¼” nuggets with occasional ¾” nuggets. The clay has been only a small factor in our pilot plant sluicing—There is a small percentage of clay. Also to be noted—we have run into a small percentage of cemented gravels. The plant consists of a track mounted, remotely operated, 200 yard/hour Terex 1700M two deck wash plant that processes up to 3/4" minus material for metals from the bench gravels on the claims. All 1/4" minus material is fed into twin Oro Industries 100 yard per hour centrifuges which reduce the screened material down to 3200 pounds of concentrates per 10 hour shift. At the end of each shift, the concentrates are transported to the process module where the concentrates are fed into a 16" cleanup centrifuge which removes all black sands and lighter impurities. The resulting 50-100 pounds of high-grade concentrates are then fed into a 16" finishing centrifuge. The finished concentrate containing precious metals, is then smelted into dory bars and shipped off-site for final processing at a metals refinery. The 3/4"-1/4" screened materials are fed onto a 4' x 21' sluice box which is attached to the mining plant and moves with it. The sluice is cleaned 3 times per week and 50-100 pounds of material is transported to the process module. Sorted on a 4' x 8' concentrating table, 1 /4" or larger nuggets and gemstones are easily and quickly. handpicked from the '1 /4"+ gravel. After removing nuggets and gems, the material is fed through the 16" centrifuges to collect float gold. All black sands and other tailings discharged from the processing module are discharged into Pond #2, the recycling pond. The 3/4" plus rock and tailings from the wash plant, the 1/4" - 3/4" tailings from the sluice box and the 1 /4", minus tailings from the 40" centrifuges all discharge continuously into the previously mined cut. All process water is recycled from the #2 recycling pond using a 6" pump connected to the plant by a 1,300' x 6" flexible retractable hose reel which enables cuts of over 1,000' in length. The Kahiltna Placer Mine is not available at this time.